When Dave Peacock stepped before a crush of reporters at Union Station last week, his main purpose was to showcase the potential of a new football stadium on St Louis’ riverfront. Dave Peacock and Bob Blitz show off a drawing of a proposed stadium on St. Louis' riverfront. Part of his pitch was economic, which is a typical tactic to gather support for expensive sports facilities. After all, a new stadium could lead to thousands of construction jobs and continued business for surrounding bars and restaurants. But for Peacock, there were more intangible reasons for the city to pursue the project — something beyond just dollars and cents. As the St. Louis Rams consider moving to Los Angeles, people around the region have been focused on how regional leaders should respond. But there’s another ongoing debate: Whether it makes sense to have a football team at all. Backers say the NFL provides an economic boost to the region and a dose of pride for St. Louisans. Others aren’t so sure that having a team is worth the price – especially if it requires an additional public investment. And the overall economic impact of a new stadium is up for some serious debate. Doug Woodruff may have an insider’s view of what happens when a football team leaves a city. 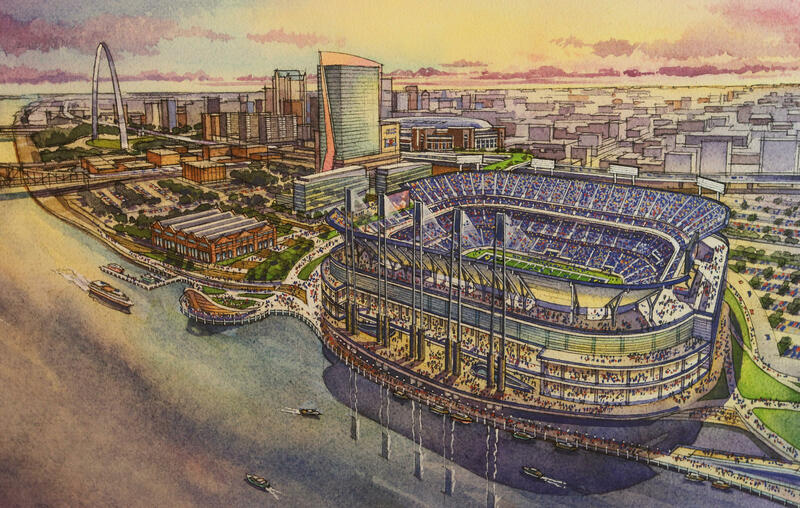 A drawing of the new stadium on St. Louis' riverfront. Woodruff, the president of Downtown STL, Inc., was the banker for the St. Louis football Cardinals before they bolted for Arizona. He said the team’s departure from the city left a void within the community. Flash-forward to today and the situation is somewhat similar. The St. Louis Rams can now operate on a year-to-year lease on the Edward Jones Dome, which the team doesn’t feel is suitable. And St. Louis Rams owner Stan Kroenke unveiled plans to build stadium in Inglewood, California – one of the clearest indications he may move the team back to Los Angeles. In response, Gov. Jay Nixon tasked Peacock and St. Louis attorney Bob Blitz to come up with a response of sorts. What the pair proposed was an open-air stadium on St. Louis’ riverfront that could also serve as the home base for a soccer team. For pigskin proponents, the argument for the new stadium is partly about economic development and partly about regional pride. Ryan Loeffler, the co-owner of Big Daddy’s on Laclede’s Landing, said the new stadium would fit in nicely with an overhaul of the Gateway Arch grounds. Those two huge projects, he said, could help his bottom line. Ryan Loeffler, the co-owner of Big Daddy's on Laclede's Landing, says a new stadium would be a boon to his business. Woodruff agrees. He said a new stadium would revamp a languishing portion of downtown St. Louis and free up space at the Edward Jones Dome for conventions. He said the region’s convention and visitors bureau estimated that arrangement could bring anywhere from $20 to $22 million in economic development. 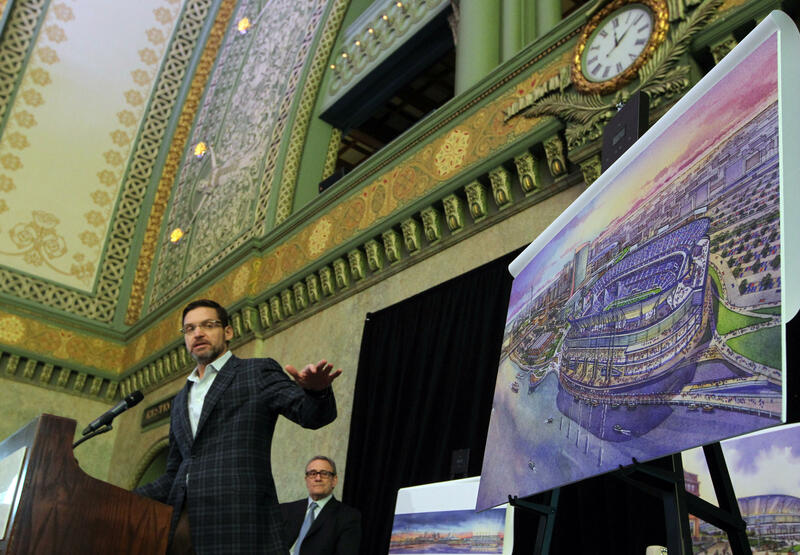 “And so, the opportunity we have here is to actually put the Rams wanting a new facility and the ability to reuse the existing facility in a much more effective manner together and in a way that should elevate economic development here,” he added. But the arguments to keep a team here aren't just about economics — pride plays a role too. More than any concrete economic impact, Woodruff said the loss of the team could have an effect on the perception of the St. Louis area. He added having professional sports are “all part of the mix” of developing the region’s culture. Both St. Louis Mayor Francis Slay and St. Louis County Executive Steve Stenger said there’s a quality of life and prestige bump for cities with NFL teams. Patrick Rishe, an economics professor at Webster University, said the departure of professional football could cause St. Louis to lose out on other sporting events. And he said it could produce a dent in the region’s prestige. Perhaps unsurprisingly, the idea of a building a new stadium just when the departure of the Rams appears imminent isn’t getting a universally warm reception. St. Louis County Councilman Mark Harder, R-Ballwin, is skeptical about "extending" bonds to pay for a new stadium -- especially when the Rams have been terrible. Some are wary about “extending” bonds that are currently paying off the Edward Jones Dome. Even though Stenger said that type of proposal wouldn’t legally require a public vote, others contend that the city and county's charters would require such a move. “Voters in both St. Louis and St. Louis County approved measures that give them the final say before tax dollars can be spent on a new sports stadium,” said Fred Lindecke, spokesperson for the Coalition Against Public Funding for Stadiums, in a statement. Even though backers of the idea aren’t positing that proposal as a tax increase, St. Louis Councilman Mark Harder, R-Ballwin, sees it as a distinction without a difference. He also said the Rams’ status as a perennially mediocre squad isn’t helping matters. Others, such as Maryland Heights resident Heather Clark-Evans, observed it’s easier for St. Louisans to focus on the plight of sports teams as opposed to tough issues like poverty and homelessness. Chuck Korr is a professor emeritus of history at the University of Missouri-St. Louis who has written several books about professional sports. He was tapped by local officials for information during the early 1990s effort to woo the Rams. He doesn’t buy the argument that a football team equates to being a “big league city.” He noted that neither Portland nor San Antonio have football teams, yet are still considered major cities. 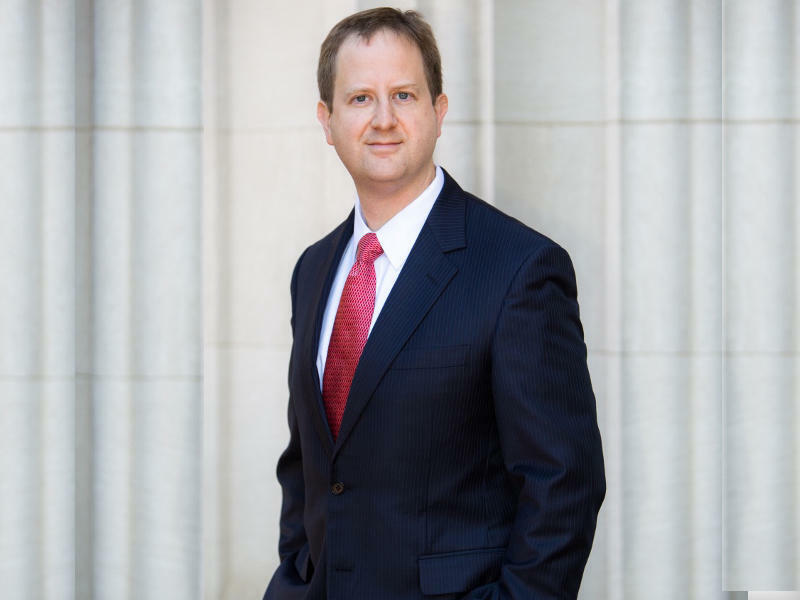 Elfenbein, the Washington University professor, said there are tangible economic benefits of having a NFL team – such as state and local tax revenue. It may not be as great as it seems, he said, because many Rams players and employees may not live here. “If the question will the city fall off the map if the Rams leave? Obviously the answer is going to be no,” he said. But he went onto say that there is some tangible benefit in fostering community pride – especially if its part of a package that attracts new residents or businesses here. St. Louis Public Radio's Jo Mannies and Stephanie Lecci contributed information to this story. This story was informed in part by the Public Insight Network. To learn more about the network and how you can become a source, please click here. St. Louis has an image problem that Ferguson either brought to light or didn’t help, depending on your perspective. St. Louis Mayor Francis Slay said addressing those image issues will take a lot of work. On this week's edition of Politically Speaking, St. Louis Public Radio reporters Jason Rosenbaum and Jo Mannies welcome the newest member of the St. Louis County Council -- Councilman Mark Harder. The Republican from Ballwin grew up in Normandy and eventually became a real estate professional. He was elected to the Ballwin City Council in 2011 and worked to mitigate the impact of a grocery store in the West County suburb. A 64,000-seat open-air NFL stadium constructed on St. Louis' riverfront could be the new home of the Rams -- or another NFL team -- by 2020, according to preliminary plans announced Friday. Weighing in on how to keep the St. Louis Rams from moving back to Los Angeles, former St. Louis Mayor Vince Schoemehl supports building a new stadium for the team. But the proposed location is wrong, he said.